Until very recently bacterial and viral infections killed large parts of human populations. This made them important factors driving human evolution in general and evolution of the human immune system in particular. In their recent publication in „The Cell“ Quach et al. 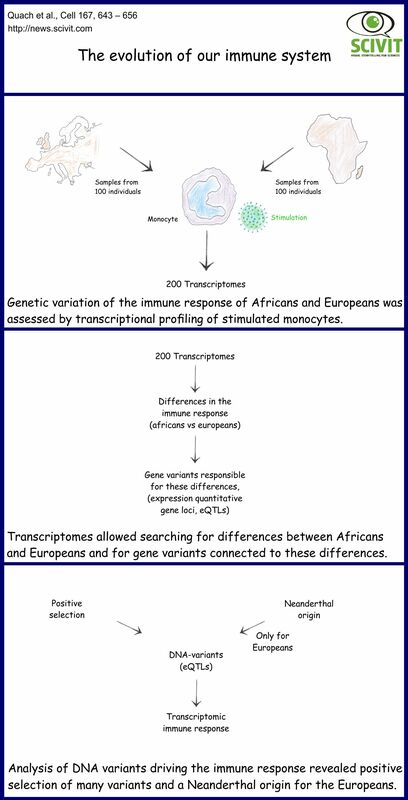 looked at DNA-sequences important for the human immune systems and at how these sequences had evolved. The scientists analyzed the transcriptome of immune-stimulated human monocytes as the molecular equivalent for the human defense response. They then searched for DNA-sequences connected to differences in this response when comparing individuals from Europe and Africa. As expected signs for positive selection of such sequences in the course of human evolution were observed. In addition, for many of the European genes, a Neanderthal-origin could be demonstrated.